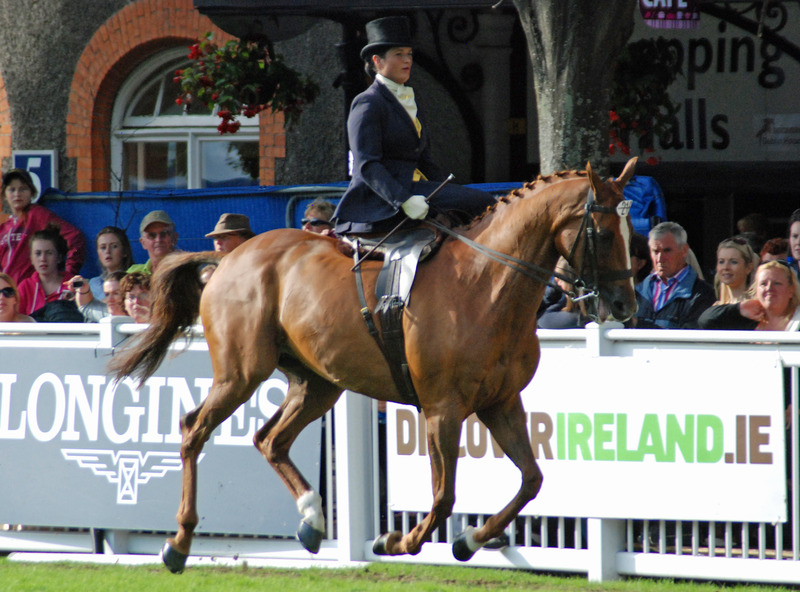 Ciara O’Connell looked after the commentary on the day explaining the intricacies of the class and turnout to the huge public crowd who had arrived to watch the class. 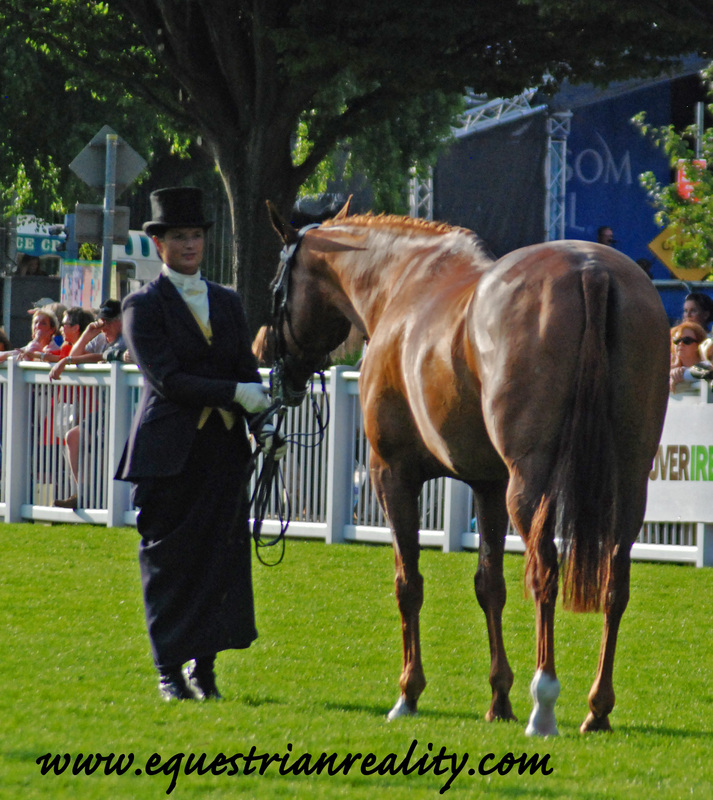 Ciara has taught so many of us Irish side saddle riders the basics from how to sit side saddle to what to drink from a hip flask and she provided much education for the masses on the day. 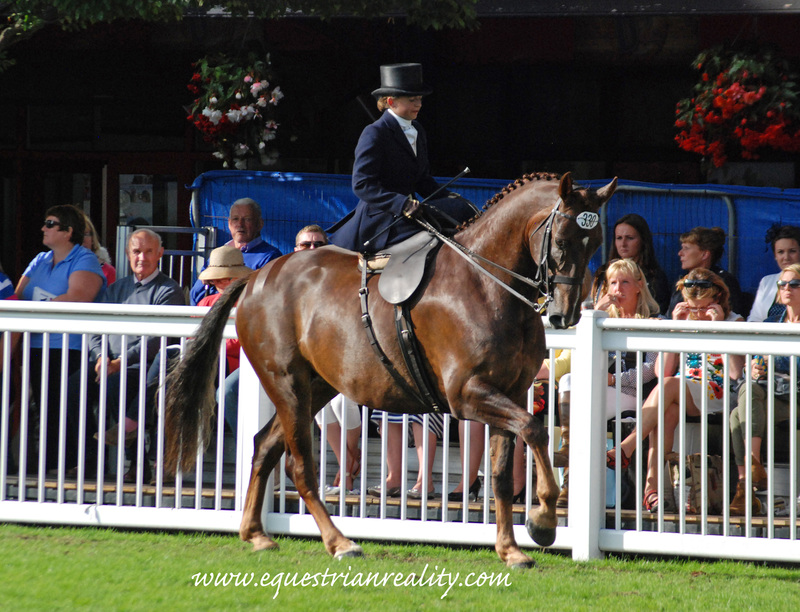 Two ladies who demonstrated a lot of versatility at the horse show were Joanne Quirke and Maeve Carty who competed in the side saddle class and the racehorse to riding horse class. 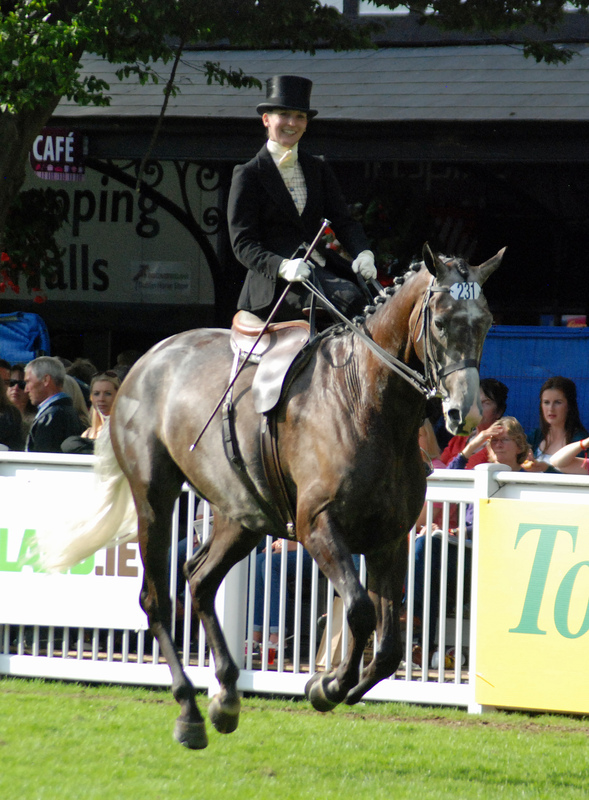 Maeve competed in both classes with Cyril Cartys Why Not Batim. 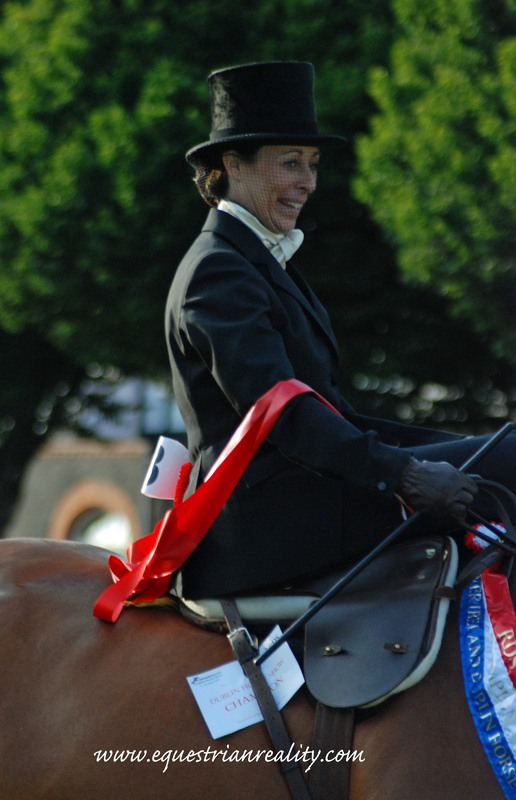 Joanne competed in the side saddle class with The Masters Artist and won the Racehorse to Riding Horse with Forpadydeplasterer. 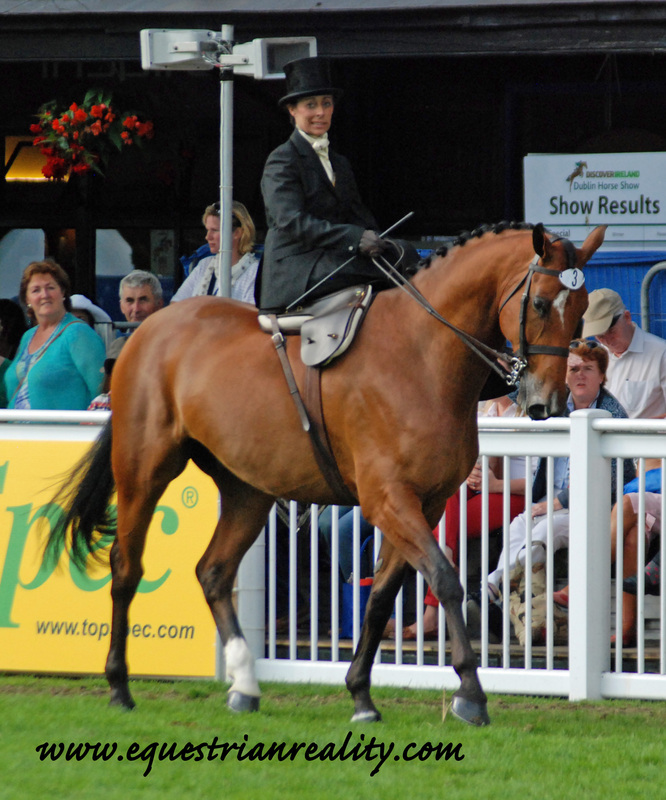 Aine Dagg was more likely to be seen on a point to pointer than on a side saddle until she took part in a documentary with world side saddle champion Susan Oakes. 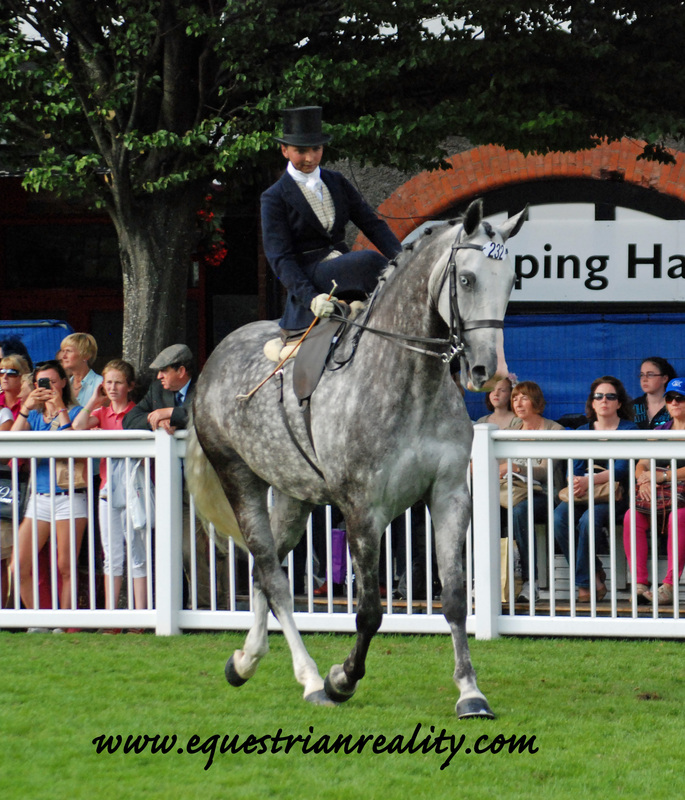 After Susan got her on board sideways Aine was converted and made her debut in the show ring this year earning her qualification at Gorey show on board her sister Maria’s grey gelding Jetsdown Superstar also known as Clint. 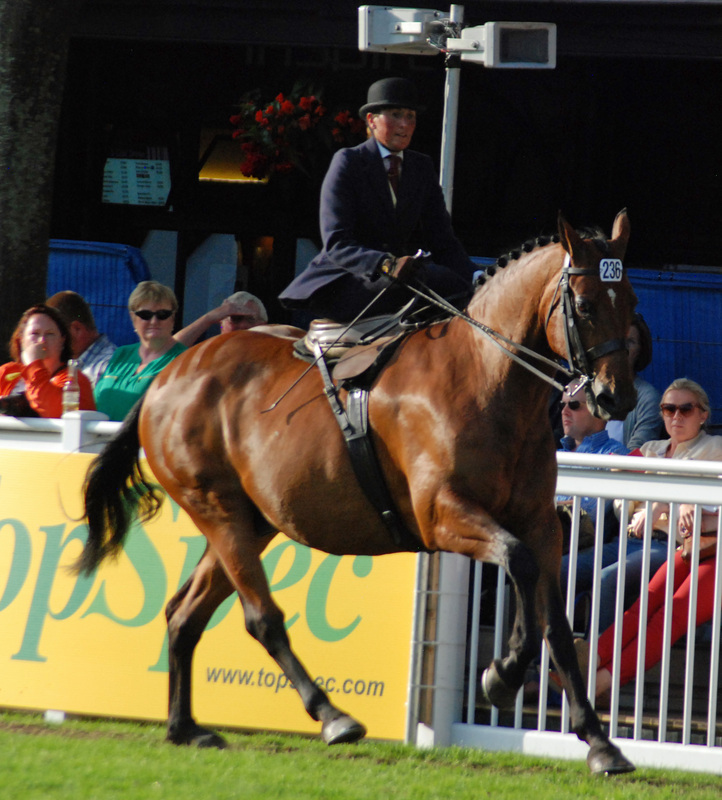 The pair finished fourth in Dublin. It was a family affair for sisters Suzanne and Lyndsey O’Brien. 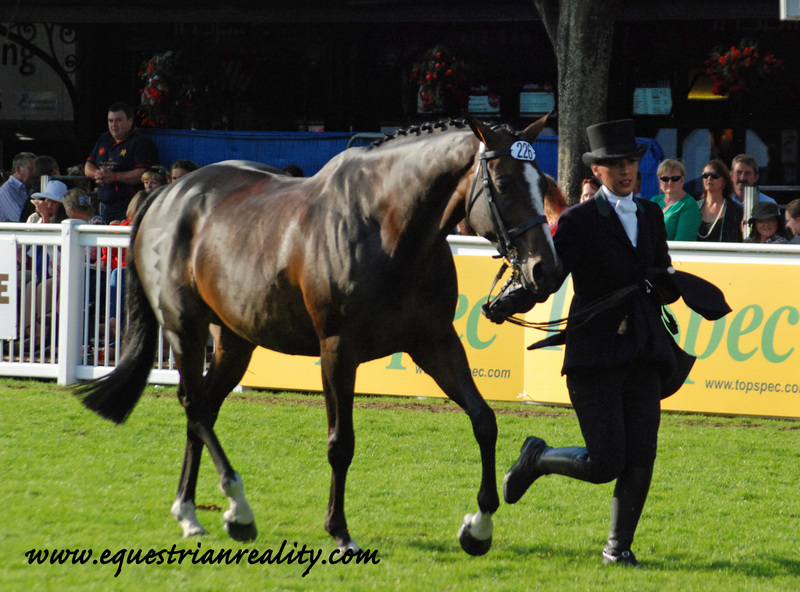 Both ladies qualified for Dublin with their horses Mr. Shakespeare and Sweetest Symphony. 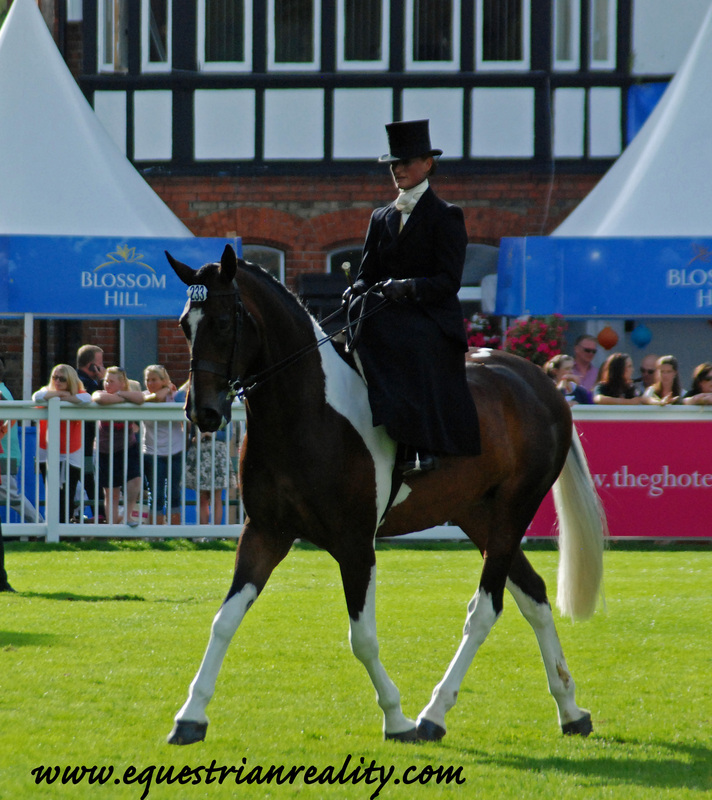 Lyndsey took second place in the ladies side saddle class with Mr. Shakespeare. The pair also won their amateur sportsmans class and took reserve amateur hunter champion. 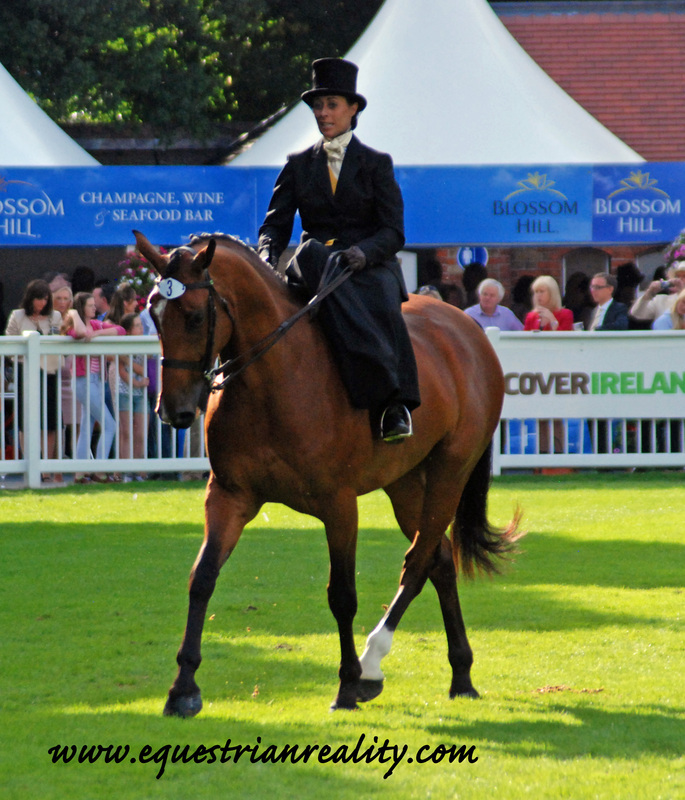 Side saddle instructor Jennifer Torrance competed in the class with Kieran Connors eventer gelding Fuerty Droim Ri. 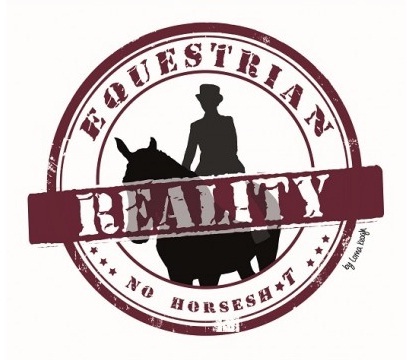 Jennifer coached many of the ladies and juniors for the RDS and was thrilled on the Sunday to see so many of her pupils doing well including Zara Nelson and Caragh Charlton who took first and third place. 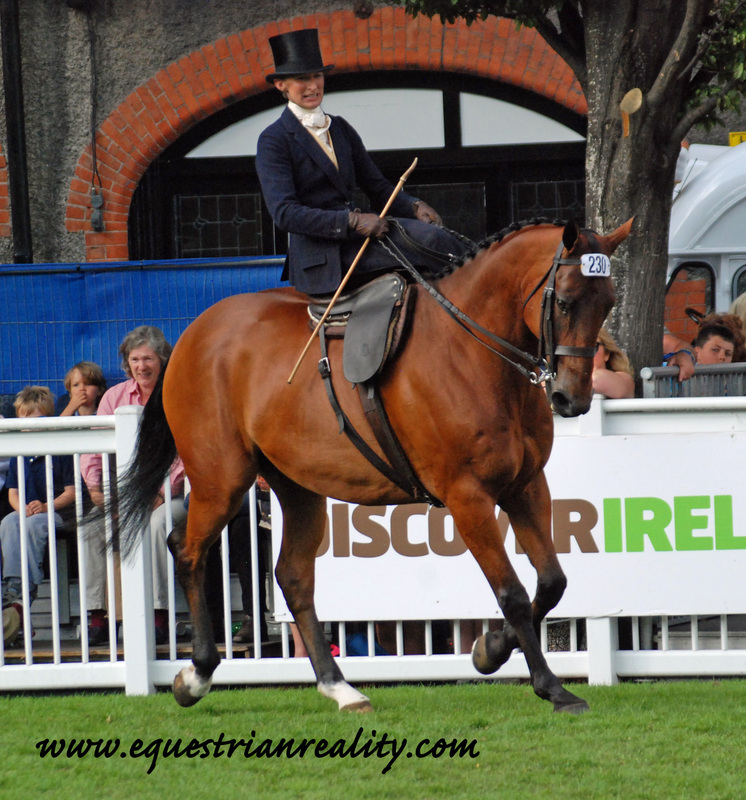 There was a special story behind the ladies who placed first and fifth in Dublin in the ladies side saddle. 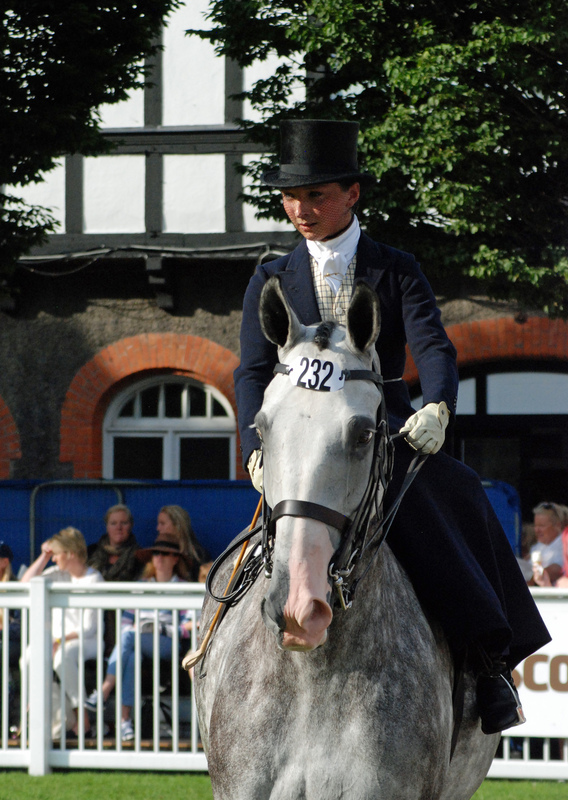 Cheryl Power and Claire Connors are two friends who decided to take up side saddle in order to compete aside at Dungarven show which awards a trophy in the honour of Claire’s late sister Clodagh. It was Cheryl herself who seemed most surprised when the judges moved her from second in the initial line up to class winner. The smile on her face said it all as she and Whitfield Jack of Hearts were awarded first place as well as the best rider trophy presented by Faith Ponsonby. 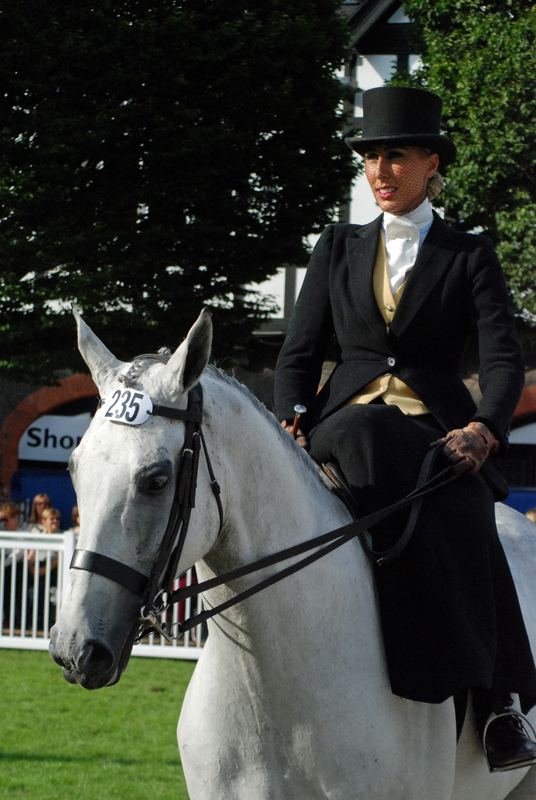 I met Cheryl when we chatted in the line-up in the lightweight hunters at Gorey show. 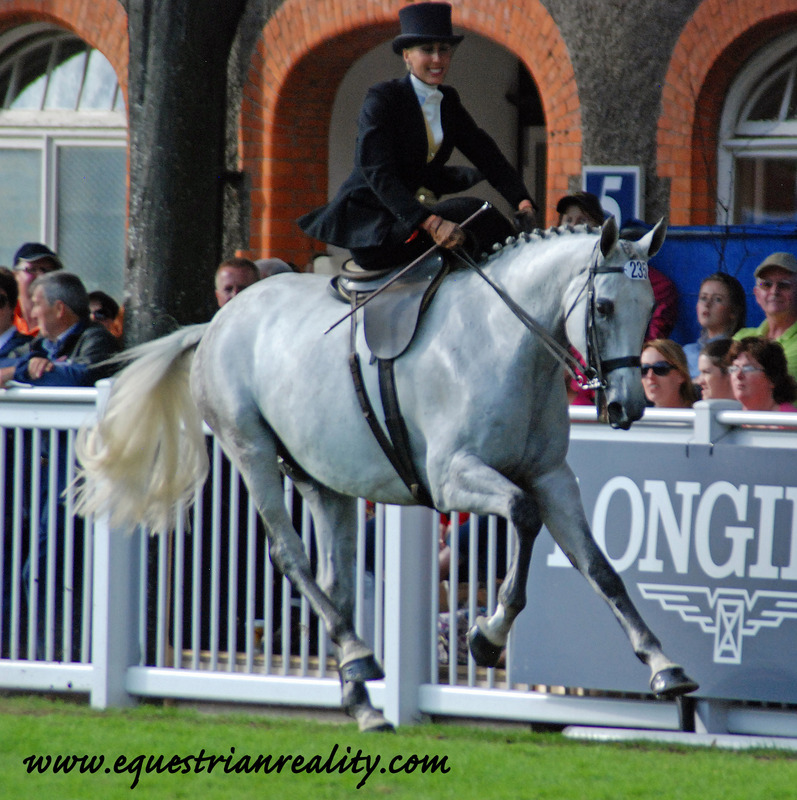 She was nervous ahead of her first side saddle class having only sat up the night before. It was clear that Cheryl had no idea that she would qualify for Dublin let alone win there which makes her achievement all the more special- if you have a dream, go for it as you never know where it will take you. 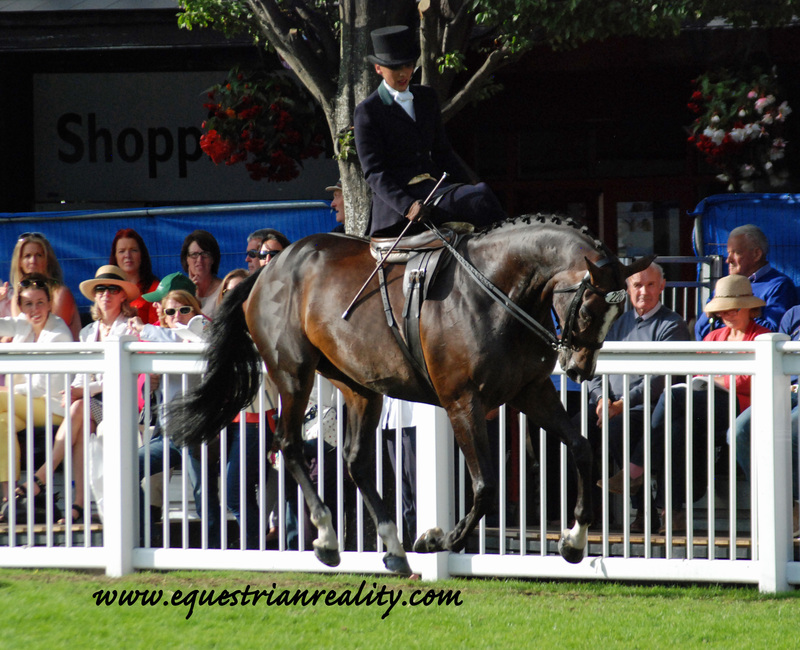 Posted on August 19, 2014, in Equestrian Photos, General, Showing, Side Saddle and tagged Cheryl Power, Dublin Horse Show, dublin horse show 2014, RDS, rds dublin, rds dublin horseshow, showing side saddle, Side saddle, Side Saddle Association of Ireland, side saddle ireland, sidesaddle, Whitfield Jack of hearts. Bookmark the permalink. 2 Comments. Thank you for a lovely resumee of the class in Dublin *that I enjoyed watching.